That was the idea behind New Hampshire Businesses for Social Responsibility’s (NHBSR) Just One Thing initiative, to create awareness and promote a mission of sustainability and environmental responsibility in businesses of any and every size. We asked NHBSR members to submit video entries to maximize engagement and sharing, of what they were doing to help. NHBSR has almost 150 members, many of whom submitted entries to have videos online at the website. But to select the best, and get a broader audience, we took the campaign to the airwaves. 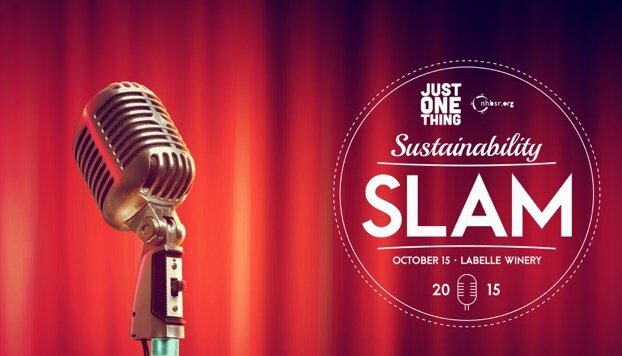 The Just One Thing (JOT) campaign culminated in October 2015 in the Sustainability Slam, an entertaining, engaging and fun networking event that included on the-spot voting to select award winners. To spotlight these stories beyond NHBSR membership, Gravity Group NE suggested and planned the “Sustainability Slam,” to bring Just One Thing into the realm of entertainment, friendly competition and crowd participation (including voting and live tweeting) beyond the NHBSR organization. Read howGravity Group NE helped NHBSR to leverage multi-channel media marketing tools to promote the Just One Thing initiative, promote membership engagement and showcase New Hampshire companies who are making a difference with CSR and sustainability efforts, both small and large.